Can a mac & cheese girl become a chef? In honor of Earth Day, I decided to go on a type of retreat: a self-imposed cooking camp in which I learn, in any way possible, about cooking and planning healthy meals. No more canned vegetables, convenience microwave meals and burritos, and packaged food products which are really closer to products than foods. This is day one, and to be honest it’s a bit of a tough psychological leap for me. The time commitment is certainly daunting. It takes hours each day to cook healthy meals, although bulk cooking on weekends will free up time during the work week. For example, Ryan spent a lot of time Sunday making a potful of lentil curry which we then ate in the form of lentil burgers for dinner on a weeknight. All he had to do was add flour. I envy Ryan’s simple grace in the kitchen. He’s not intimidated by knives and extremely loud appliances with blades. Even the scary gas stove with not all its burners working doesn’t stop him from sauteing, stir-frying, and boiling up a steam. He lets the dishes slide sometimes, but I do, too. In fact I try to avoid cooking and doing dishes whenever possible! 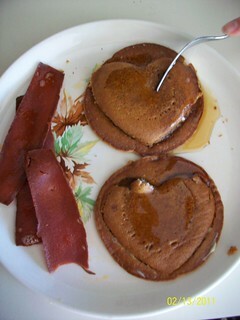 An example of a not-so-healthy meal disguised as a healthy meal: frozen sweet potato pancakes, pre-packaged vegan “bacon” and maple syrup. Thus, this week’s focus is all about food preparation and meal planning. My first goal is to get myself interested in whole foods, spices, and new meal options with regard to planning a week of healthy eating. My secondary goals are to become more comfortable in the kitchen and happy to be there cooking and cleaning up. I would love to learn how to chop vegetables the “right” way rather than guessing, and I want to have more organization when it comes to storing recipes and any information I need regarding cooking – like how to make rice, quinoa, or lentils without having to Google it. The old way of eating was comfortable for me, and I didn’t shun cooking as much. We used a harmless-looking electric stove that didn’t harm our indoor air quality. We used a lot of cheese and gluten-filled convenience foods that I can’t eat anymore. 100% of the main recipes Ryan & I cooked as newlyweds are now off-limits due to ingredients that affect my health, as of April 2012. This transition to almost-veganism left me helpless in the kitchen, so I turned to potato chips and Amy’s burritos. This photo is from our past, of a meal that I used to have fun preparing, cooking and eating. My goal is to have some photos for you this week of meals produced without heavily processed ingredients. We’ll see how that goes. We do get it right from time to time, but mostly I eat from the freezer, lol. If I succeed at teaching myself a new way to exist in the kitchen, it’ll not only be helping my health – it will be a great gift to Mother Earth for Earth Day! I think this is also the first step towards growing my own food in greater quantity, by learning how to cook with fresh whole foods more frequently so I know how much we need to plant and which kinds of foods we eat most. Thanks Penny! I’ll have to check out that website, sounds like it could help us with the bulk cooking and storing. Last night we cooked with a kabocha squash for the first time; photos and story to come!